This small market town is charming with some very interesting buildings, a weekly market and most amenities. The impressive and oversized town hall stands proud on the market place, symbol over a zealous previous mayor with over optimistic ambitions for his town. The river Ouche, has its source in a near by village called Lusigny-sur-Ouche, flows very calmly through the town centre, heading downstream to join the canal at Pont d'Ouche. Some of the small streets are very interesting to walk through with some very old buildings, especially the "Rue de l'Eglise" which takes you up to the church. The atmosphere is calm, friendly and active, you'll find restaurants, museums and wine tasting. The local tourism office has bicycles for rent and the local camp site is an ideal rest point if your on your way to the south. A worthwile visit is the "Tool museum" and discover all kinds of tools used by different craftsmans throughout history. 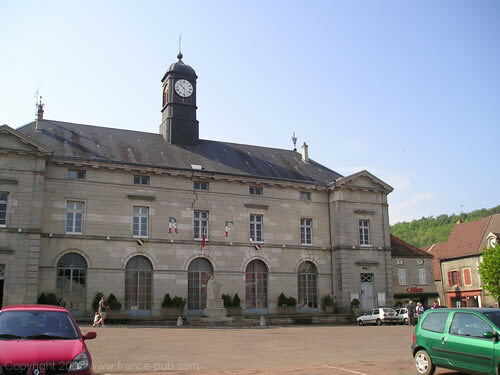 The impressive town hall of Bligny sur Ouche. You can also enjoy a fine wine tasting session in the company of Dominique Achard, he runs the gallery called Vinantica, which houses a wonderful collection of wines from all around the world. You can also enjoy the art exhibitions in the same building. The local food market is held every Wednesday morning on the square in front of the town hall.